Lynch rolls up Carmella for a one count. Carmella pushes Lynch. Carmella tries to slap Lynch but Lynch almost puts Carmella in the Dis-Arm-Her. Carmella gets the corner and tags in Natalya. Lynch and Naomi beat down Natalya. Sliding slap by Naomi. Running hurricanrana by Naomi. Natalya dumps Naomi on the mat. Naomi manages to counter Natalya’s attack into a wheelbarrow stunner. Naomi sets up the split legged moonsault. After a distraction by Carmella, Natalya is able to powerbomb Naomi out of the corner. Carmella does the moonwalk then hits a bronco buster. Naomi kicks out. The heels take turns beating on Naomi. Naomi manages to tag in Lynch, who clears the ring. Lynch hits a missile dropkick off the top. Natalya tags in Carmella, who hits a jawbreaker on Lynch. Naomi lands a head kick on Carmella. Lynch hits a top rope leg drop. Natalya breaks up the pin. After a distraction by Natalya, Carmella hits the Stratusphere off the top. Natalya tries to give Carmella the Money in the Bank briefcase but Lynch knocks Natalya off the apron. Carmella kicks Lynch in the face for the win. Riott almost hits the Riott Kick. Flair avoids it. Flair double legs Riott and almost slaps on the Figure Eight. Riott escapes. Flair tries a back elbow in the corner. Riott hops on Flair’s back and puts her in a sleeper. Flair drops to the apron back first to get Riott to release the hold. Sarah Logan and Liv Morgan appear. Riott hits the Riott Kick! Flair kicks out. Riott dumps Charlotte to the outside. Morgan and Logan close in. Naomi and Lynch run to ringside and chase Morgan and Logan away. Riott tries to suplex Flair. Flair reverses it into a slingshot suplex. Riott manages to hit deadly nightshade. Stage dive senton for a near fall by Riott. Flair kicks out. Riott traps Flair in a nasty straight jacket hold. Flair gets to her feet but Riott pulls her back down to the mat. Flair is bending in ways that shouldn’t be possible. STO buy Riott for a near fall. Riott tries another senton but Flair gets her knees up. Hangman’s neck breaker by Flair. Flair goes up top but Riott pushes her to the outside. Riott tries a dive to the outside but Flair catches her and fallaway slams her into the barricade. Moonsault off the barricade by Flair. Flair sends Riott back into the ring. High knee by Flair. Flair goes up top again. Riott cuts her off. Riott sends Flair flying off the top with a hurricanrana. It’s not enough to keep the champion down. Riott badmouths Flair. Riott mocks Flair and chops her over and over again. Flair fires up and lands several stiff chops of her own. Riott sends Flair head first into the middle turnbuckle. the Riott Squad act as if they are getting in the ring. Naomi and Lynch run into the ring to stop them. The referee kicks Naomi and Lynch from ringside. Morgan and Logan attack Flair while the referee is distracted. The referee tosses Morgan and Logan. Flair almost locks in the Figure Eight. Riott turns it into a small package for a near fall. Riott tries deadly nightshade again but Flair turns it into a facebuster into the top rope. Flair locks in the Figure Eight for the submission victory. Winner and STILL Smackdown Women’s Champion, Charlotte Flair! After the match, Asuka comes to the ring! Asuka gets close to Flair and points to the WrestleMania sign. Flair just smiles. Becky starts with a waistlock takedown but Alexa elbows her in the face and transitions to a side headlock. 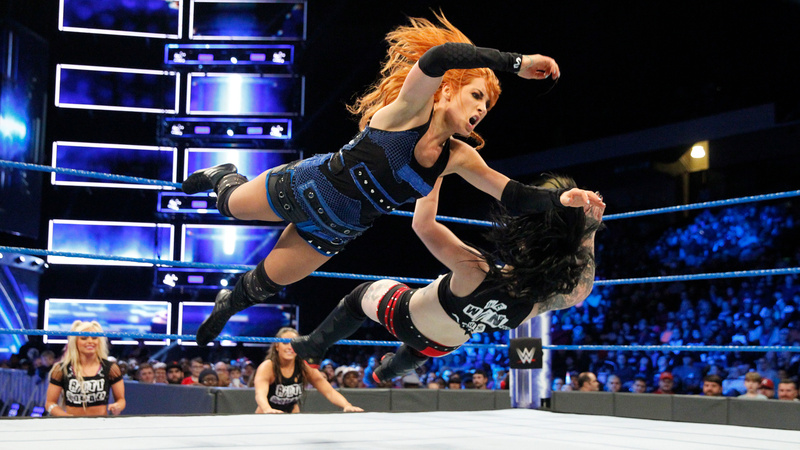 Becky reverses it and sweeps Alexa’s leg before going for a backslide pin, but Alexa bridges up and tries to tag out. Becky stops her and goes for another pin attempt, then she applies a bodyscissors and cartwheels Alexa around the ring to disorient her. Alexa tells Braun she knows what she’s doing, and Braun says he trusts her, then Alexa walks into a couple of dropkicks and the fans chant for Braun. Sami chants back ‘never gonna get him’ but Alexa finally gets an opportunity to tag, and Sami reluctantly gets in the ring. Sami dances around and feigns jabbing Braun, but ends up jumping out of the ring and buying some time. Braun gives chase and Sami ends up kicking him in the face, but it just pisses Braun off, who goes for a powerslam. Sami floats over and tags out, so Braun goes to his corner but Sami immediately tags back in and hits Braun from behind. Braun shakes it off and biels Sami across the ring, then Alexa tags in but Becky meets her with a kick to the midsection. Alexa comes back with a quick strike and a near fall, then applies a side headlock but Becky comes back with an enziguiri. Alexa tags out and Sami immediately gets hit with a corner splash, then he goes for a tackle but Sami pulls the ropes down. Braun lands on his feet and catches Sami after he dives off the apron, but Braun just slams him on the floor and Sami tries to run for it. Sami pulls Braun’s beard and dives off the barricade, but Braun catches him and slams him on the barricade, then goes back in and tags Bliss, who hits Twisted Bliss off Braun’s shoulders for the win. Alexa Bliss and Charlotte are out to watch the match. Banks and Lynch lock up. Banks tries to toss Lynch. Lynch avoids it. Lynch tries to dump Banks. Banks avoids it. Banks tries the Banks Statement but Lynch hooks the ropes. Logan stomps both Lynch and Banks. Logan hits a pop up headbutt to Banks. Logan drags Lynch into the corner and tries to lift her over the top rope. Rose almost slams Banks over the top rope. Banks hits the ropes and runs right into a running high knee by Rose. Lita faces off with Banks and Lynch. Lita clothesline Banks. Rose kicks Lita in the gut. Lita monkey flips Rose into ground and pound strikes. Lita knocks Rose off the apron. Mandy Rose has been eliminated. Sane takes out Lynch and Banks. Roaring corner elbow by Sane to Lita. Sane hits a flying elbow strike off the top. InSANE elbow drop by Sane to Banks. Tamina kicks Sane in the head. Lita DDTs Tamina. Lita hits the Twist of Fate on Banks and Lynch. Lita hits the moonsault on Lynch and Banks. Tamina charges Lita. Lita pulls down the top rope. Lynch tosses Lita over the top. Brooke pushes Sane off the top rope. Kairi Sane has been eliminated. Wilson hits an X-Factor on Banks. Logan floors Wilson with a dropkick. Wilson sends Brooke out to the apron. Wilson dropkicks Brooke in the knee to eliminate her. Dana Brooke has been eliminated. Torrie Wilson has been eliminated. Morgan double foot stomps Banks. Logan and Morgan both try to dump Banks. Banks holds on the ropes. Holly picks up Logan and just throws her over the top rope. Sarah Logan has been eliminated. Molly goes out top and hits the Molly-Go-Round on Banks! As soon as Lana gets in the ring Deville and Morgan stomp her. Lana goes nuts and slaps Deville. McCool dumps Deville and Morgan. Sonya Deville and Liv Morgan have been eliminated. McCool picks up Molly Holly and throws her over the top. Molly Holly has been eliminated. Vickie just yells excuse me over and over again. Vickie says when she speaks everyone will listen to her! Vickie tries to reason with them. Vickie tries to run away. EVERYONE picks her up and throws her out. Vickie Guerrero has been eliminated. Carmell moonwalks in Vickie’s face. Vickie hits Carmella with the Money in the Bank briefcase. Carmella knocks Natalya off the apron before she can get in the ring. Carmella gets in the ring and superkicks Banks. Michelle McCool has been eliminated. Naomi hits multiple rear views. Naomi destroys Banks with a kick to the face. Lynch dropkicks Riott. Riott sends Lynch over the top but Lynch holds on. Riott hits Lynch’s hand and she falls to the outside. 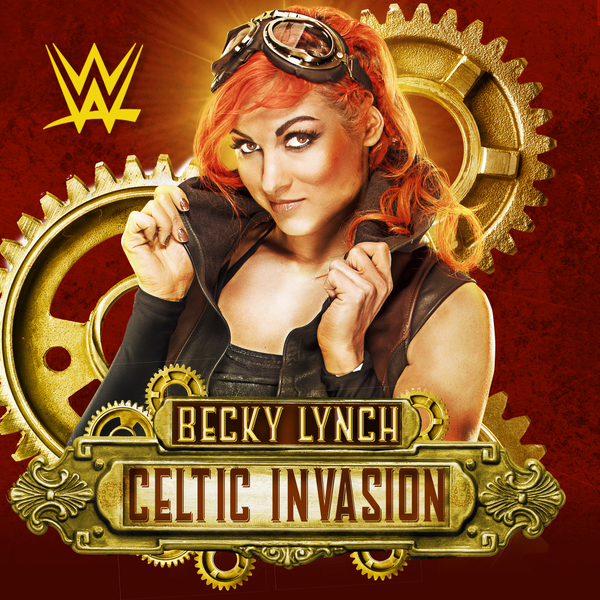 Becky Lynch has been eliminated. Jax tosses out Jaqueline and Kelly Kelly. Kelly Kelly and Jaqueline have been eliminated. Jax press slams Riott out of the ring. Ruby Riott has been eliminated. Jax tosses Naomi over the top but Naomi lands on everyone else. Naomi stands on the barricade. Moon hits a springboard splashes Jax. Jax picks up Moon and tosses her clear across the ring. Naomi grabs a chair and walks on her hands to get into the ring. Naomi dives off the top but Jax catches her. Jax throws Naomi over the top. Phoenix and Jax battle. Phoenix almost lifts Jax for a Samoan drop but she can’t get Jax up. Jax bad mouths Phoenix. Phoenix lifts of Jax and walked her to the ropes. Jax escapes. Natalya attacks Jax. Natalya and Phoenix knock Jax through the middle rope. Natalya and Phoenix hug. Natalya slaps Phoenix and tosses her out of the ring. Beth Phoenix has been eliminated. Asuka clear the ring. Moon and Asuka face off. Moon hits the Eclypse on Asuka. Asuka still manages to toss out Moon. Ember Moon has been eliminated. Brie saves Nikki. Brie lines up everyone and hits her running knees. Jax tries to get back in the ring but Brie and Nikki dropkick her off the apron. Stratus hits Stratusfaction on both Nikki and Brie at the same time. Stratus hits the Stratusphere on Bayley. James and Stratus face off. Stratus kicks James off the top rope. Mickie James has been eliminated. Everyone piles on Jax. Jax pushes everyone away. Everyone gangs up on Jax and tosses her out. Nia Jax has been eliminated. As Bayley celebrates Banks grabs her by the head and throws her out. Stratus kicks Natalya out of the ring. Banks gets in Stratus’ face. Stratus kicks Banks and tries Stratusfaction. Banks counters and dumps Stratus over the top. Trish Stratus has been eliminated. Asuka and Banks are about to team up but Banks attacks Asuka from behind. The Bellas and Banks stomp Asuka. The Bellas toss Banks. Sasha Banks has been eliminated. Asuka kicks both Bellas over and over again. Asuka dumps Brie to the apron Nikki hits her finish on Asuka, then knocks Brie off the apron. Brie Bella has been eliminated. Asuka hits a dropkick off the top on Nikki. Nikki hits her finish on Asuka again. Asuka gets dumped to the apron. Asuka and Nikki fight on the apron. Nikki knocks Asuka on her back. Asuka kicks Nikki in the knee and she falls off the apron! Nikki Bella has been eliminated! Naomi takes down Morgan then hits her running slap. Naomi and Morgan trade pin attempts. Morgan matrixes under a clothesline by Naomi. Naomi tries multiple head kicks but Morgan keeps ducking. Naomi switches it up and knees Morgan in the head instead. Morgan trips Naomi into the corner. Morgan double foot stomps Naomi. Carmella, Lana, Becky Lynch, and Natalya all come to ringside. Naomi rolls up Morgan with a sunset flip for the win. After the match, a brawl breaks out between all the women. Natalya picks up Lynch and tosses here over the top rope. Carmella and Natalya toss Morgan over the top. Natalya destroys Carmella with a rolling lariat. Naomi and Lynch chase away Natalya. Lynch tries to throw Naomi over the top rope but Naomi lands on the apron. Lynch and Naomi stare at each other. Charlotte comes out and says good luck to all the women in the Royal Rumble. Good luck to the winner since they will have to face her at WreslteMania. Flair and Morgan lock up. Flair sends Morgan to the mat. Flair women handles Morgan- tossing here around the ring. Morgan kicks Flair in the face. Morgan gloats. Flair lights Morgan up with chops. German suplex by Flair. Morgan tags in Riott. Flair tosses Riott around the ring. Flair tags in Lynch. Flair and Lynch beat down Riot with chops and uppercuts. Naomi tags in and sends Riott to the outside. Naomi tags Lynch back in. Lynch dives off the apron onto Riott. Logan tags in. After a distraction by Morgan, Logan knees Lynch in the head. Basement knee by Logan. Riott tags in and hits a senton off the top. Lynch kicks out. The heels take turns working on Lynch. Logan tries to throw Lynch over the top rope but Lynch reverses it and sends Logan to the outside. Lynch eventually tags in Naomi, who clears the ring. Naomi lands the disaster kick on Morgan. Morgan gets to her feet but Naomi goes into the Chun-Li kicks. Flair spears Logan. Riott kicks Naomi in the face while the referee is distracted. Morgan hits a modified Code Breaker for the win. Lynch takes Riott down to the mat over and over again. Lynch grabs a front face lock. Riott gets to the ropes to escape. Lynch goes to hit the ropes by Logan grabs her foot. Lynch yells at Logan. Riott tries to attack Lynch from behind but Lynch avoids it and sends her out of the ring. Lynch sends Riott back into the ring. Multiple arm drags by Lynch. Lynch locks in an armbar. Lynch tries her leaping kick in the corner but Riott catches Lynch’s foot. Riott sends Lynch chest first into the top rope. Riott stomps Lynch. Riott puts Lynch in a seated abdominal stretch. Lynch gets to her feet. Lynch whips Riott into the corner. Lynch charges in but Riott hit deadly nightshade. Riott puts Lych in a body scissors. Lynch struggles to try to get out. Riott rolls Lynch over into a pin but Lynch kicks out. Lynch manages to hit her corner kick. Riott whips Lynch back down to the mat. Lynch kicks out. Riott drives her knee into Lynch’s back over and over again. Riott goes back to the abdominal stretch. Lynch hip tosses Riott out of it. Small package for a near fall by Lynch. Lynch lays into Riott with rights and lefts. Spinning back kick by Lynch, followed by multiple bex-plexes. Riott kicks Lynch in the gut. Riott tries to set up the Riott Kick but Lynch counters it into the Dis-arm-her. Riott taps. Morgan and Natalya lock up. Morgan takes Natalya down. Natalya kips up to her feet. Natalya takes Morgan down and Morgan kips up. Natalya tries a clothesline but Morgan matrixes out of it. Natalya spins and hits a discus lariat. Natalya tries to lock in the Sharpshooter. Morgan retreats to the outside. Riott tags in and gets beat down in the Welcoming Committee corner. Carmella tags in and moonwalks on Riott. After a distraction by Logan, Riott takes Carmella down with an STO. The Riott Squad takes turns beating down Carmella. Carmella manages to tag in Tamina. Tamina clears the ring and superkicks the heck out of Riott. The crowd actually goes nuts for it. Samoan drop by Tamina to Logan. Tamina goes up top for the Superfly Splash. Morgan pushes Tamina off the top. Logan lands a handstand knee drop to the back of Tamina’s head for the win. After the match, Riott tells the crowd that magic isn’t real and that they are all entering the Women’s Royal Rumble. Charlotte comes out and congratulates the Riott Squad. Charlotte says she is going to give Riott a dose of reality. Actions have consequences. Naomi joins Charlotte on the stage, as does Becky Lynch. The faces rush the ring. a huge brawl breaks out. Charlotte boots Logan in the face. Naomi hits the Disaster Kick on Morgan. Lynch hits an exploder on Riott and Morgan. 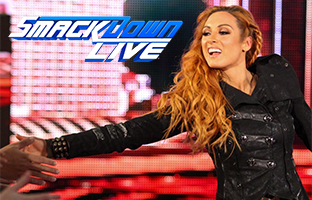 – Captain Becky Lynch is backstage with the rest of Team SmackDown. Natalya interrupts with a whistle and asks who’s excited to see her decimate & dominate tonight. Becky says they don’t have time for antics and asks Natalya to shut up. Becky goes back to her speech with everyone else chiming in. Lana mentions how Tamina Snuka will take care of Nia Jax tonight. 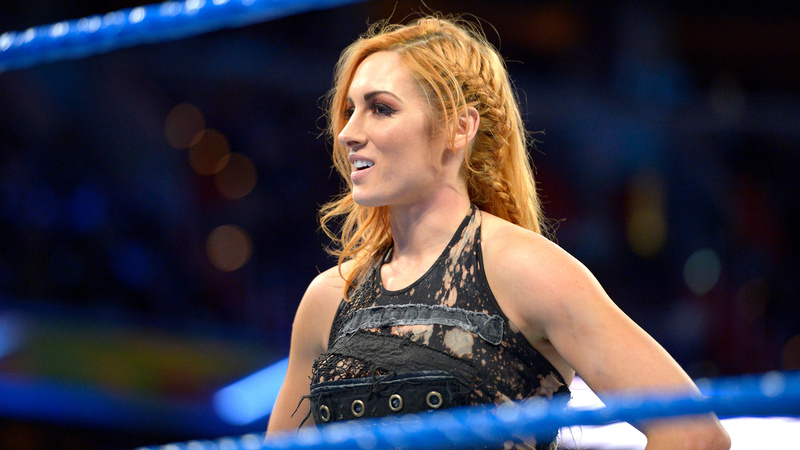 Becky says they will prove SmackDown is the show tonight. They all appear to be on the same page as we go back to the panel. 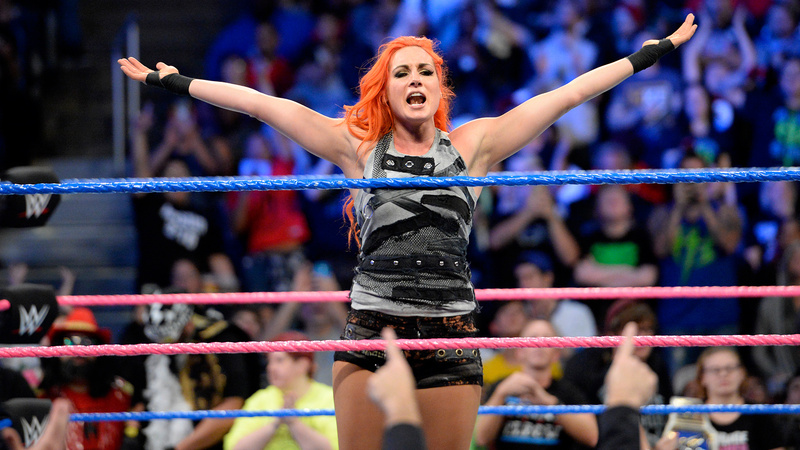 We go to the ring and out first comes Captain Becky Lynch for our first Traditional Elimination Match. Carmella is out next with her Money In the Bank briefcase. Natalya is out next, followed by Tamina Snuka with Lana, and Naomi is out last. Captain Alicia Fox is out first for her team. Bayley is out next as Fox waits at ringside. They hug. Sasha Banks is out next, followed by Nia Jax and then Asuka. Fox starts off with Becky as the captains go at it to lock up. Fox takes it to the corner and the referee breaks them. Fox with a knee to the gut and more offense to take control. Fox with some slaps and trash talking in the corner. Becky kicks Fox to the mat and runs her over. Becky charges with a forearm in the corner and keeps control of Fox. 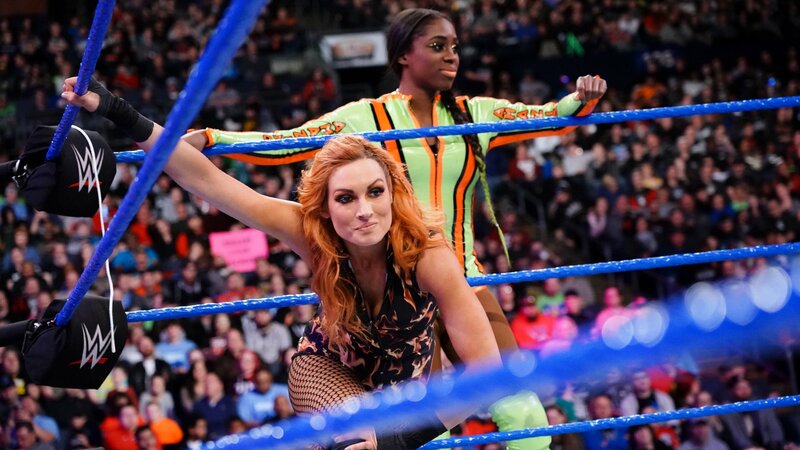 Fox dumps Becky to the apron but Becky drops her Becky goes to the top and hits a big leg drop for a 2 count. Becky waits for Fox to get up and goes for the Disarm Her. Fox gets to the ropes and breaks it. Fox elbows Becky and Bayley tags herself in. Becky with a Bexploder to Fox. Bayley comes from behind and rolls Becky up for the first pin. 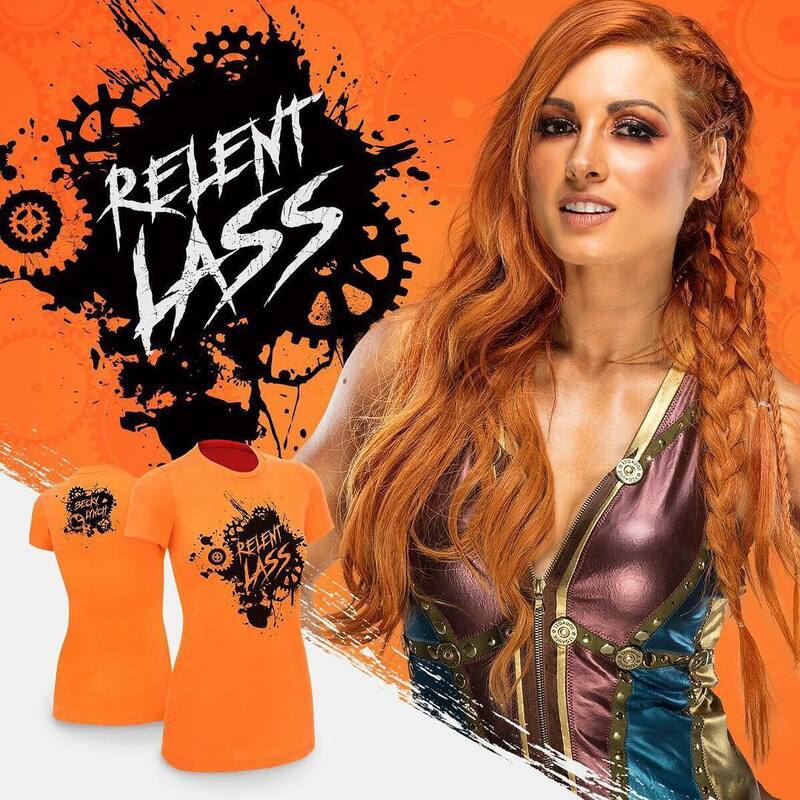 Becky has been eliminated. Natalya comes in and goes at it with Bayley now, working her over in the corner. Natalya keeps control and hits a suplex for a 2 count. Natalya with knees in the corner now. Tamina tags in as some fans chant for Lana. Bayley avoids a splash in the corner and turns it around on Tamina. Asuka tags in and unloads on Tamina with kicks and knees. Fox tags right back in and takes over for a quick double team to Tamina in the corner. Bayley tags right back in. Tamina drops Bayley with a punch and takes her back to the blue brand corner. Tamina unloads on Bayley and Natalya tags back in to keep the attack going. Natalya runs into an elbow. Bayley drops Natalya, Tamina and Carmella, then Naomi from the corner. Natalya decks Bayley and tags in Carmella for some double team stomping on Bayley. Carmella gets elbowed by Bayley. Bayley tosses Tamina to the floor but Carmella takes advantage and superkicks Bayley. Tamina goes to the top and nails the big Superfly splash on Bayley for the pin. Bayley has been eliminated. Nia comes in and faces off with Tamina for a family face off. Nia drops Naomi on the apron and taunts Tamina. They lock up and break. Nia connects with a headbutt. Tamina comes right back with a headbutt of her own. They face off again. They collide with headbutts now and both stumble around. Nia rams Tamina back into the corner and gets riled up, hitting a splash next. Nia with a cannonball on Tamina for a close 2 count. Tamina ends up trying to scoop Nia for a Samoan Drop but it’s blocked. Nia decks her and goes for a Samoan Drop but it’s blocked. Nia charges and knocks Lana off the apron as she jumps up. Tamina with two superkicks to knock Nia out of the ring. Naomi ends up coming off the apron to take out Nia on the floor. Tamina follows and ducks a Jax clothesline. Tamina drops Nia with another superkick on the floor. Tamina returns to the steel steps as the referee counts. Tamina with a crossbody off the steel steps. Nia gets counted out. Nia has been eliminated. Fox comes in and yells for Nia to come back. Naomi comes from behind and rolls Fox up for a 2 count. Naomi takes Fox to the corner now. Naomi eventually knocks Fox off the top with an enziguri. Naomi goes for a split-legged moonsault but Fox blocks it and turns it around. They trade shots. Naomi counters the tilt-a-whirl backbreaker. Naomi with a close 2 count. The referee actually counted a 3 count but it sure didn’t look like it. Fox has been eliminated. Sasha comes right in and applies the Banks Statement to Naomi. She taps out. Naomi has been eliminated. Carmella comes in and hits a suplex on Sasha for a 2 count. Asuka gets the tag and unloads on Carmella in the corner. Asuka with more kicks to Carmella. Asuka with a Hip Attack on Carmella for another 2 count. Carmella ends up turning it around on Asuka and hitting a Bronco Buster. Carmella taunts Sasha and then slaps Asuka. This angers Asuka. Carmella with another shot as Asuka gets to her feet. Asuka goes on and floors Carmella with a kick for the pin. Carmella has been eliminated. It’s down to Asuka and Banks vs. Tamina and Natalya. Natalya comes in but gets hit with a double suplex. Sasha with a 2 count on Natalya. Natalya slaps Sasha now. Sasha fires back with a big shot. Natalya ends up hitting the discus clothesline for a 2 count. Sasha with forearms and a dropkick to Natalya. Sasha with the double knees in the corner. Sasha drops Natalya over the ropes and hits the other double knees. Sasha with the Banks Statement on Natalya. Tamina breaks the hold. Sasha walks over to Tamina but Natalya rolls her up from behind for a 2 count. Natalya drops Sasha hard in the corner. Natalya with the Sharpshooter on Banks for the submission. Tamina knocks Asuka off the apron as Sasha taps. Sasha has been eliminated. Asuka looks on from the floor as Natalya and Tamina stand tall. Asuka enters the ring and Natalya attacks her in the corner. Tamina and Natalya double team Asuka now with stomps. They hit a double suplex. Tamina picks Asuka up but Asuka fights her. Fans chant for Asuka as Tamina hits a powerslam for a 2 count. Tamina with another slam to Asuka before going up. Tamina misses the Superfly splash as Asuka rolls out of the way. Asuka hits a jumping armbar on Tamina and makes her tap. Tamina has been eliminated. Natalya comes in and goes right to work on Asuka. Natalya goes for the Sharpshooter but Asuka counters and applies a submission but Natalya breaks it. Natalya with a kick. Asuka ducks the discus clothesline and drops Natalya with a spin kick. Asuka drives Natalya into the mat and applies the Asuka Lock for the submission. Asuka wins. – After the match, Asuka stands tall as her music hits. We go to replays. James Ellsworth is shown backstage. Tamina walks out of the locker room. Ellsworth asks her to get Carmella. 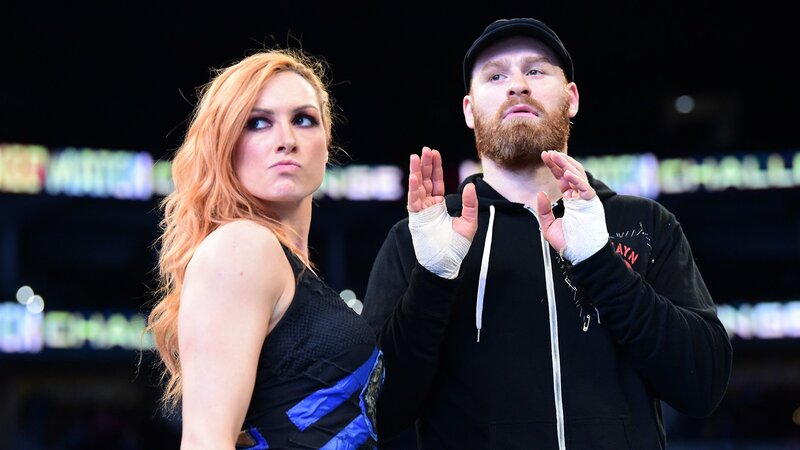 Instead Becky Lynch comes out and says that he needs to worry about her. Ellsworth says that she has no chance because he is a man and she is a woman. Lynch says that those were ballsy statements and says that Ellsworth doesn’t have any. Ellsworth does push ups in the ring. Then sizes up Lynch. Lynch gets a hold of Ellsworth arm but he makes it to the top. Ellsworth takes off his shirt. Tie up and Ellsworth takes down Lynch. The two tie up again. Ellsworth has a hold of Becky but Lynch lifts Ellsworth and places him on the top rope. Gives him a few slaps and then backs away. The two go back and forth. Lynch goes for numerous roll up pins to no avail. 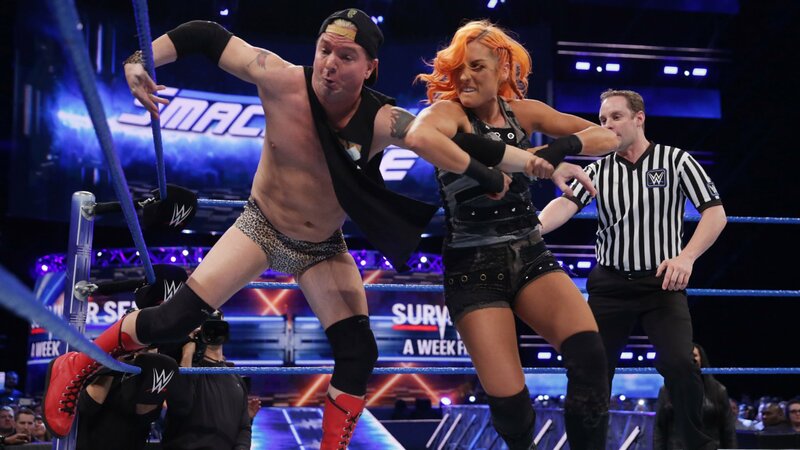 Lynch lifts Ellsworth on her shoulder and spins Ellsworth. Then she throws him out of the ring. Ellsworth mocks the women on the outside. Lynch goes to the top rope, but misses Ellsworth. Ellsworth sends Lynch into the turnbuckle. Lynch hits an atomic drop. Exploder suplex. Ellsworth rolls out of the ring, but is brought back in by the woman on the outside of the ring. Ellsworth tries to make amends and hugs Lynch. Lynch puts in the armbar. Ellsworth taps. Carmella picks up Ellsworth and starts arguing with Lynch. Carmella then superkicks Ellsworth. Carmella leaves Ellsworth lying the center of the ring.